Well, all good plans and all that! We headed for Dover as planned, all going well so we stopped off for a coffee at Stanstead services. Having a wee break, we discovered that we were now starting our journey a little lighter – the bathroom skylight had decided to eject somewhere down the M11 in the gale force winds! Second cup of coffee proved that we lost our indicators somewhere on London’s North Circular – they still haven’t come back! We decided to head for the ferry, as that way we are still en route to Italy, not limping by the side of the road somewhere in the UK and we had a ferry to catch, goddammit! Ferry journey and trek to Belgium and our first motorhome stop was good, we even got in a little shopping and managed to speak Flemmish to someone! As we were still none the wiser with the electrics, we decided to head for Ghent, hoping that we could be closer to a mechanic with our Breakdown service.So Friday evening we drove in as much of a straight line as we could to our second motorhome stopover in Ghentbrugge. We parked up amongst what can only be described as an international roller girl convention and hit the sack for the night. Saturday was hopeful, yet that dwindled by the end of the day. We soon discovered that we were nearly out of water and that had also impacted on the need to empty the on board loo! Alas, there were no such facilities in sight! Undeterred, we called our ADAC services and were promised a mechanic within the hour! Yippee! After a fair bit of poking and checking what had already been checked, Manuel decided that though everything in front of the bonnet was fine, there was obviously something wrong under the dashboard, but he didn’t have time to look. He left us bewildered with two addresses for Peugeot garages to call on Monday morning. Lots of umming and ahhhing ensued and discussions of what to do. Do we wait where we are til Monday for the hope of a garage, whilst running out of water and loo capacity? Or do we move to another Aire (free motorhome stopover)? One thing left to do. Under cover of the night we legged it to Rotterdam and a campsite with proper facilities and the ability to refill and empty. 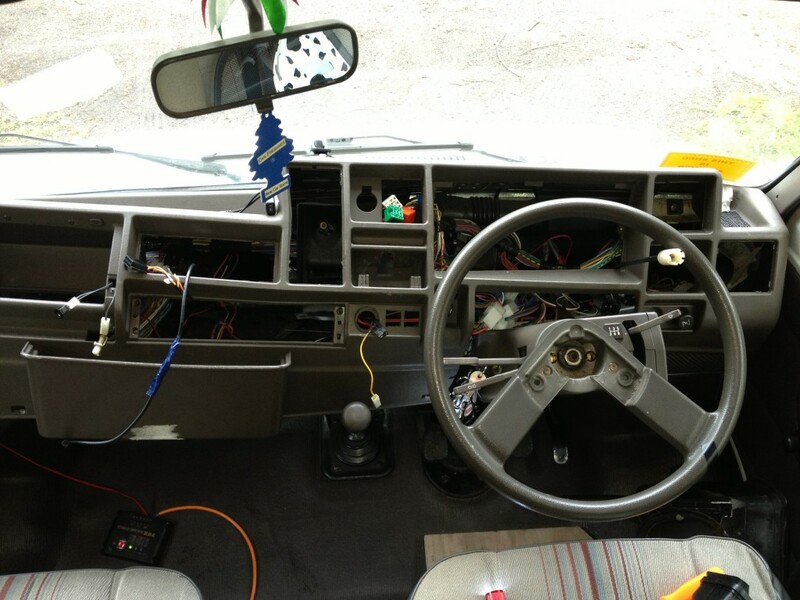 With a day to spare, and the help of Talbot Owners Forum, I could have a look at removing the dashboard during the day. Nothing to lose! OMG 6 lanes of motorway traffic round Holland! And no indicators! And no Loo soace!!!! AGGGHHHH! Well this is how far I have got at removing the dashboard, which was going well until I had to remve bolts from the inside of the bonnet under the windscreen. I managed 2 out of 4! I did however manage to removed about 20 years worth of crap from the air intake though, so not all bad!